Hey everyone! Hope you have had a lovely Saturday. I have a had a lovely day just relaxing and watching films. If you follow me on twitter (xbellefleurx) then you would have seen that I am in quite a lot of pain at the moment. I have an incredibly bad back pain and I think it's a trapped nerve but I'm not sure. I can barely move and it's really irritating. I have also been applying for a few jobs today as even though I have had a relaxing day I absolutely hate sitting in the house doing nothing. I really do want a proper routine in my life as I do love working. That got me thinking about a blog post. I know a lot of people out there are going through that stressful process of applying for jobs, looking at colleges or universities to go to, having exams coming up and having gone through all of these things throughout my life I know how incredibly overwhelming that can be, to the point where you do end up breaking down and losing your cool a little bit. However there are ways that these things can be calmed down. I thought that I would compile a little list of things that I do to help me to relax and also things that you can do when times get a little bit tough and you need some me time. Enjoy! With social media being such an important part of today's generation we will always find ourselves on there whether it is twitter, or facebook, or youtube or snapchat we will always be on our phones either texting our friends or checking the latest news on twitter and facebook. We are constantly bombarded with information and recently I've been spending so much time on my phone I have found it to give me such a bad headache. I switch my phone off for at least two hours everyday. You might not think it, but it really does help with the stress and as you're not constantly glaring at a bright screen you will find headaches tend to improve too. One of my favourite things to do lately to relax and wind down is to take a long warm bath with some of my favourite beauty products and a few candles lit on the side. It's just so relaxing and really helps get rid of all the tension in my back. At the moment I have a really bad pain running from my neck down to the middle of my back and it's awful. Having a warm bath is definitely helping it, but even if you don't have a pain they are the best things to have to relax. You can follow this up by pampering yourself as well with a nice face mask and some of your favourite beauty products. I find this is best done on a Sunday night just to help relax and prepare you for the week ahead! When it comes to social media it's safe to say it's something I'm always on. For talking to my friends on facebook to keeping up to date with my favourite bloggers on twitter and communicating on their a lot I'm just always on social media and I've recently noticed I've been getting a lot of headaches and the first thing that popped into my head is because I am always on my phone and laptop. It's really not that healthy but when you're applying for a ton of jobs every day online and your favourite hobby is also online it's hard to switch it off. The past few days I've started to avoid social media in the mornings/afternoons and have been reading a book or going out instead. From a very young age I have always loved books. I just love getting into bed or sitting down with a good book and just getting lost in another world for an hour or two. I find that it is very therapeutic and helps me relax and forget everything else going on for a short while. I find it odd when people say they don't like to read as not only does it help you relax but also broadens your mind and improves intelligence too. I love reading so much. I'd highly recommend it. Something I've been doing from the age of around 12 is keeping a journal. When I'm a bit upset or emotional or even just need to get a few things off my chest I just get everything out in my journal. I'm onto my fifth journal now. I was browsing through a couple of my older ones the other day and there is some very juice stuff in there. Some quite cringe worthy stuff as well but I can't wait to sit down when I'm a lot older and just read back through them and see just what my life was like. It will be extremely interesting. A lot of the time I don't really feel like I can talk to anyone so this is my way of just getting everything out. It really does help and is very relaxing too and it's an excellent way of writing down everything that has happened in your life and making sure the best bits are written down. I also find writing the hard bits down important too as it's a way of looking back and seeing how well you dealt with it and how much you've changed as a person since. It's that time of the year where a lot of people are at the stage, whether it's at university or school where a lot of final exams and final assignments and dissertations are just about to hit deadline day. This means a lot of time sat inside revising and looking at computer screens all day and perhaps even all night. Something I find to be very relaxing and de-stressing is to just step outside and go for a walk. Whether it's through the park or even up to the shops to perhaps by a coffee you won't be stuck in front of the screen and it will help you unwind and help give you a fresh mind too. For me a warm drink consists of Hot Chocolate as I don't drink tea or coffee and sometimes I opt for some walk milk and honey. A warm drink is perfect for just helping you relax and de stressing you. It gets you away from the computer screen or whatever work it is you're doing and again give you a fresh mind. This is linked to ' Have a nice long walk' to as if you don't want to make anything at home then you can just talk a walk to the shops and buy one. One of my favourite things to do to relax is listen to music. I've created a 'Sleep' playlist on spotify which has some of the most relaxing songs on it and it really just helps me relax and takes me to another place. Yes I use to it fall asleep too as well but it's perfect if you just want to chill out and relax. I normally have this on in the background whilst I'm reading a good book too or when I'm in the bath as it just sets the mood. So these are just a few things that I do to help me to relax. A lot of them you probably already do and some of them you probably think won't help, but trust me when I say they really do help. Especially the social media one. I really hope you enjoyed this post and that it'll help you on your way to a more stress-free life. 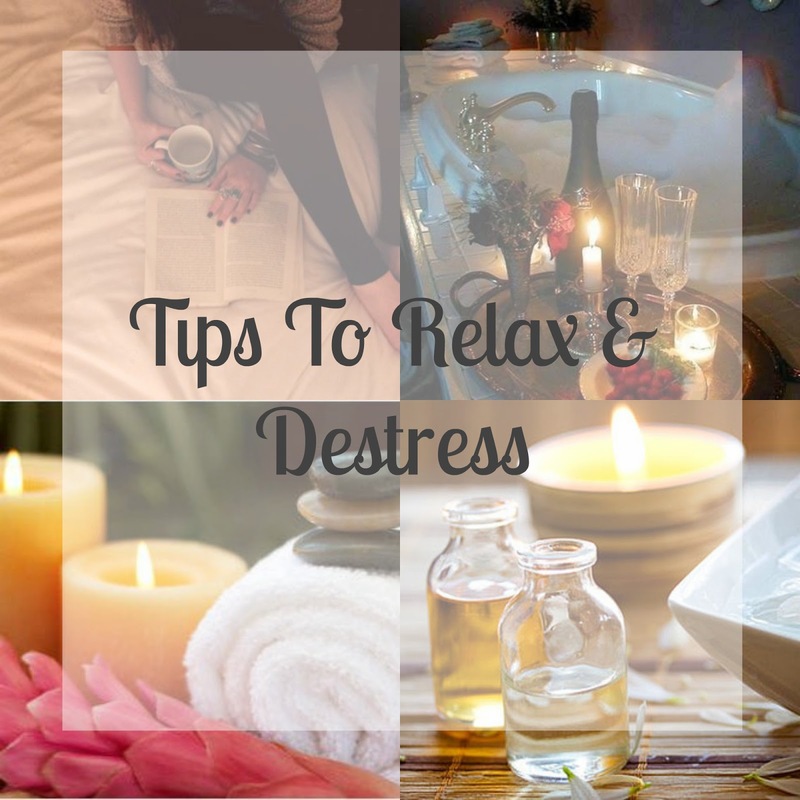 What things do you do to help you relax and de-stress? Love this! I NEED to make an effort to turn my phone off more - I can waste so many hours literally doing nothing on it when I could be relaxing in a nice hot bubble bath reading a magazine! Love this post, I love my journal and using a colouring book helps with stress as well, i have quite a few haha =] so relaxing.